Arsenic in well water is colorless, odorless, and tasteless. The only way to identify its presence is to have the water tested through a state certified lab. 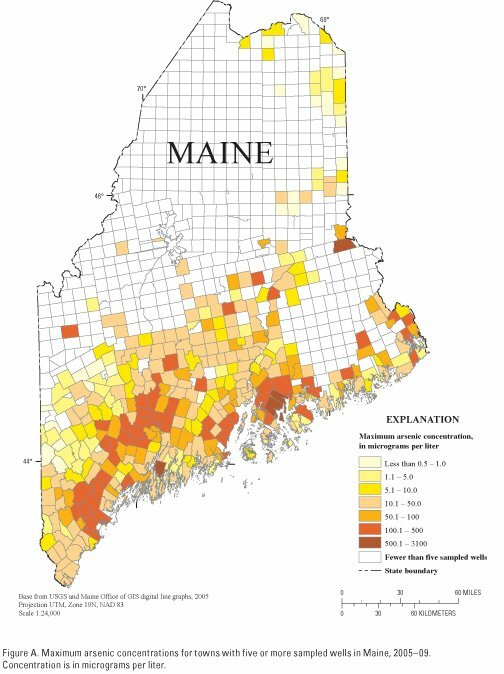 Maine’s state limit was dropped in 2006 to less than 10 ug/L. 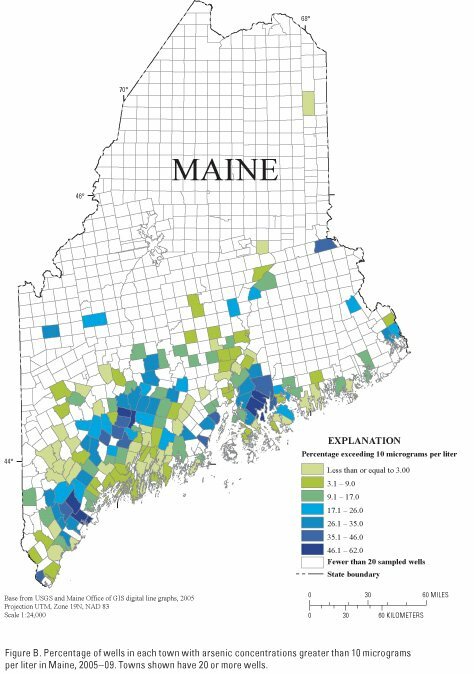 The State of Maine estimates that 1 in 10 private wells in Maine have arsenic concentrations above this limit. There are two different types of arsenic prevalent in well water, arsenic 3 and arsenic 5, therefore, if you do have arsenic above the acceptable limit, we will recommend doing an arsenic speciation water test. This will determine what type, or how much of each type, of arsenic is present in your water. This step is very important in determining how your well water is treated for arsenic. Other factors, such as iron, manganese, and pH level will come in to play, also. Arsenic is a toxic element that can increase the likelihood of health problems and is a known human carcinogen that may cause cancer of the skin, bladder, lungs, kidneys, or liver. Also, it may cause an increased risk of cardiovascular disease, peripheral neuropathy, skin hyperpigmentation, and diabetes. Major exposure occurs when drinking or cooking with contaminated water. Boiling water actually concentrates the amount of arsenic in the water and in turn, exposes you to higher doses of arsenic. We highly recommend you do not drink or cook with water that is found to have high levels of arsenic. Additional exposure may occur when showering, bathing, and brushing teeth. There are several ways to remove arsenic from well water. If you do have arsenic in your water, we may recommend installing an arsenic system specific to your needs. Please contact us directly to discuss your well water if your water test results are unfavorable. If your water has been found to contain arsenic we can treat it with an arsenic removal system. There are basically two types of arsenic removal systems, a point of use filter and a whole house treatment system. Typically, we install whole house treatment systems. A whole house system ensures you eliminate exposure for you and your family. The arsenic system comes with a complete program that includes sampling, performance testing, technical support, and even disposal of spent media. The system consists of a control panel, head, and two filter columns. Periodic samples will be taken before, between, and after the columns to ensure the water is arsenic free. Sampling is usually done every nine months depending on the particular chemistry of your water. If we find that arsenic is coming through the first column, it is replaced. Meanwhile, the second column is still protecting your family. Due to the sensitivity of an arsenic treatment system the water going into it must conform to certain guidelines. Therefore, other treatment equipment for iron, hardness, or sediment may have to be installed. There are different ways of removing arsenic from well water. If you do have arsenic in your water, please contact us directly to discuss your situation.